I read recently that tomatoes are basically not worth eating unless they’re home-grown over the summer and eaten August. There’s just something those about sun-warmed, ocean air-sweetened, soil-gritted, garden-harvested tomatoes that screams summer. Unfortunately, it also screams end of summer. Luckily for us, summer doesn’t technically end until for another five days and it looks like global warming will afford us at least one more mid-80 degree weekend so we can relish in the beauty of these delicious little orbs for just a bit longer. Run out to your garden or hit your local farmer’s market this weekend and snag every tomato you can carry. Whip this galette up for a cocktail hour appetizer. Serve alongside a handful of arugula tossed in lemon and olive oil and transport your mind to the Tuscan countryside or a Parisian café. Throw a fried egg on top for breakfast. 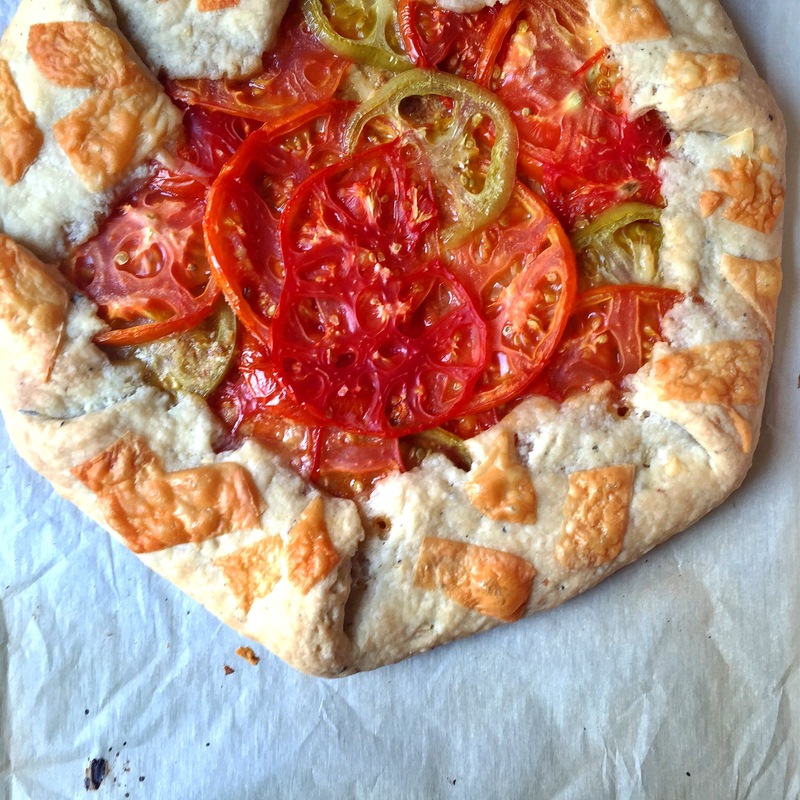 Make your own rules, just savor those end-of-summer-tomatoes. Preheat the oven to 400 degrees F. Combine flour, salt, baking powder, butter, and cream cheese in a bowl and mix with your hands until a coarse meal forms. Add vinegar and ice water and stir until all ingredients combine to form a dough. Move dough to a lightly floured surface and shape into a disc. Wrap in plastic wrap and refrigerate for 30-60 minutes. When the dough is chilled, roll out into a 13″ circle on a lightly floured counter. The circle should be about 1/8-1/4 inch thick. Transfer dough to a parchment-lined baking sheet and spread mustard evenly over the crust, leaving approximately a 1-inch border. Shake panko crumbs over the mustard and top with tomato slices, overlapping the tomatoes as you go. Fold the edge of the crust into the center and press gently to secure – this will ensure the good guts of the galette to stay put. Sprinkle the crust with parmesan cheese and bake for 25-30 minutes, or until the crust is golden in color. Remove from oven and allow your gorgeous galette to cool. Garnish with your favorite herbs, sea salt, and more cheese as you wish.